Happy Monday everyone! With the holiday season rapidly approaching, I’ve got just the thing for you – a new holiday card giveaway from Satsuma Press! Lynn from Satsuma Press just launched a brand new line of gorgeous custom letterpress holiday cards, and she’s offering three lucky winners the chance to win 25 cards each! Each winner will have the opportunity to personalize the cards with their choice of one of Lynn’s beautiful nature-inspired motifs and up to three lines of custom text. So here’s how to enter: Head on over to the Satsuma Press shop and choose your favorite motif (feather, sprout, wreath, foliage, maple seed pods, eucalyptus) from Lynn’s new holiday collection. Then come back here and leave a comment with your selected motif! You’ll have until 11:59 p.m. EST on Friday, November 12 to enter – bonne chance! I love the wreath motif – really simply but stunning! These are beautiful! I love the wreath motif, simple and classic! I love the maple seed pods–simple and beautiful! I am in love with the wreath motif! Thank you for introducing me to these wonderful designs! I am loving the clean and simple wreath motif! I’d love to have these to send out to my friends and family, very chic. As we have been gathering addresses for the assorted wedding paper-goods that need to go out, I finally feel like I have a full Rolodex of all the people who I’d love to send a holiday card to! What better way to start my holiday card giving than with these beautiful cards! If I was the lucky winner, I would love to share the feather design with my family and friends! I’d love to receive the eucalyptus cards. I’m about to get married and these would be the perfect holiday cards for us as newlyweds! They are all incredibly beautiful, but I especially love the wreath design. I love the feather motif! I really like the wreath – so simple and pretty! I like the maple seed pods the best. But they are all so beautiful. I like the wreath best, but it is a tough choice! I love the feather motif! they are all so beautiful! I love letterpress cards– delightful to give and receive. My favorite motif is the wreath, both because it is beautiful and because it says, “Happy New Year”, thus giving me more time to send it out! I LOVE them all, but the wreath motif is absolutely my fave! 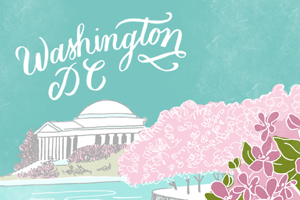 Such a lovely work… I think I found my calendar on her website also! My favorite for holiday cards is the wreath motif. The wreath motif is lovely! It would be a great card to send to our friends and relatives! I love the wreath motif, but they are all beautiful. what a tough choice! these are all so pretty – I think I like the wreath best. ooooh! LOVE satsuma press! i think i like maple seed pods but since this is for the holidays… wreath! These are all so lovely, but eucalyptus is my favorite! I love the wreath! Great giveaway! LOVE the maple seed pods!!! I think the wreaths are gorgeous! I love the maple seed pods: sweet and simple. And, I also love that the wreath doesn’t look christmas-y: just delicate and pretty. So lovely! My favorite is the Wreath Motif! I love the new way of thinking about the traditional winter wreath, in the wreath motif. These little cards will definitely cozy-up some mailboxes this season! All the designs are so charming! but the falling maple seeds have set my heart aflutter! I must admit I also love the wreath. It seems to be the popular one. Simple and classic. I adore the wreath motif. All of them are so lovely and restrained, though. Gorgeous! Very pretty! I like the wreath! I love the feather motif best! I love the wreath motif! Simply beautiful! eucalyptus is my absolutely favourite. love the grace of the movement! Satsuma Press has been a favorite of mine for a while now. The wreath motif is just lovely! Quite nice! I’m diggin’ on the foliage — great this time of year! i absolutely adore the feather, but the wreath is a very close second! The wreath design is my favorite! What a beautifully simple take on a holiday classic! Thanks for the chance to win! All so understated and lovely, but the wreath is my favorite. Beautiful work as always from Satsuma Press! 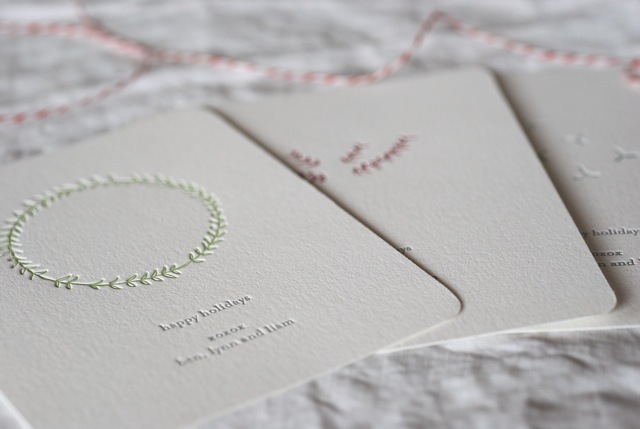 I am in love with letterpress, and the Satsuma holiday collection is a treat! The design that makes me swoon is the wreath with its subtle simplicity. I like the eucalyptus – very unique and beautiful! Ooh – the wreath for sure. And the letterpress makes it even better! Oh, the wreath is truly beautiful and simple! I’d love to send out these gorgeous holiday cards! What a great giveaway!!! All the motifs are so so so beautiful!!! and so elegant!! I love them!!! but maybe I would choose the maple seed pods… Thanks!! Simply beautiful. I love the minimalist wreath motif most! Gorgeous cards. I’m torn between the sprout and eucalyptus motifs. It’s so hard to chose just one, but my favorite has to be the eucalyptus! Loving the eucalyptus motif! I bet the letterpress paper smells lovely, too. I would definitely choose the feather motif – since it matches a lovely “birds of a feather” print I purchased a while ago from Satsuma Press. Let me just say her products are even more beautiful in person! The wreath is so perfect for the holiday season! Maple seed pod. love the whimsy of it! The wreath is such a beauty! Simple but perfect. I would be delighted to send out such beauties. I love the wreath the very most. I love the wreath motif too! Wonderful work! I love the wreath motif! Mhmm, the simple wreath is enchanting! would love the wreath cards! the wreath motif is perfect. its simplicity is what i’m drawn to for the holidays! The wreath is the perfect motif for the holidays. I love it! i love, love the sprout cards! The wreath motif is absolutely lovely. The wreath for sure~it’s just lovely! I do believe I like the wreath the best. In high school my literature teacher would already read it to us the day before Christmas break. Now I read it to my family on Christmas Eve. We cry every year! These are GORGEOUS! So simple and lovely. Oh the wreath is just too lovely – amazing giveaway! lovvve letterpress cards! my favorite is the wreath. thanks for the chance to win! i love wreath. it would make a perfect elegant and understated holiday card! definitely feeling the wreath. but the cheeky sayings sell it for me! The feather is definitely my favorite. Simple and elegant, with a hint of whimsy. I love the wreath, full of understated holiday simplicity and elegance. Oh, they’re all lovely, but I think foliage is my favorite! i am deeply deeply in love with the wreath motif. gorgeous texture. love. Wreath, please! Thanks for the chance to win! xoxo. That wreath is pretty irresistible. Thank you for the chance to win! Thanks for all the wonderful round-uping of beautiful things and these giveaways. I appreciate it. that wreath is so elegant. fingers crossed! Absolutely love the wreath! I would be thrilled to be able to stick these in the mail! I think the wreath motif is absolutely perfect simplicity for christmas cards. i usually go over the top with glitter, so these would be a lovely change of pace for me. hurray christmas! The wreath feels like the perfect balance of “explicitly holiday” and “sophisticated.” Thanks for the chance to win! I would love a set of the MAPLE LEAVES POD cards! 🙂 So beautiful. We don’t get a lot of letterpress here in Sweden, so these cards would truly stand out. maple seed pods – what memories of peeling them apart and sticking them to my nose… thats the way I like to remember holidays – simple, silly, and fun! thank you for the awesome giveaway! choosing between the holiday motifs, the maple seed pods really catches my eye…but out of everything, i think it’s the “made with love” gift tags that really make me swoon, too! The wreath is so elegant and beautiful! That was an easy choice: choosing the wording to go with it will be tough! Gorgeous! I would definitely have to go with Eucalyptus in the Silver Sage colour! The cards look absolutely beautiful! Especially the wreath in silver sage… Thank you very much for the opportunity. I really admire the simplicity of the wreath—it’s seasonal and celebratory, but in a lovely, understated way. Thank you for the giveaway, fingers crossed! I love the wreath! So simple and yet beautiful. Oh the wreaths, the wreaths, the wreaths. They are all so utterly lovely. ooh la la! and oh, i am really liking sprout! so simple and pretty. I love the eucalyptus motif, but the wreath would be perfect for Christmas! The wreath! So understated and perfect for a simple holiday! Love it! I’m totally in love with the sprout! omg, i would love to win these. so beautiful, simple, and understated. perfection. I love th foliage and the wreath, but for holiday the wreath wins! I’m Jewish, so finding holiday cards without a religious theme is always a challenge. LOVE the feather for that reason. It’s just plain beautiful without being too much! love, love, LOVE the wreath. Simple and perfect. This is probably what it’ll take for me to do Christmas cards this year! These are lovely! My favorite is the wreath. Simple and elegant! Wreath is my personal fave! down in san diego, there’s a lot of eucalyptus so i’m partial to that design. though i’m loving them ALL. absolutely gorgeous! I love the sprout design, but you make it very difficult to choose! I love the wreath cards, and would love to win them for Christmas. Letterpress… Swoon! oh. my. i might be reduced to begging on this one… please! pick me! tough decision – its a tie between the wreath and the gorgeous euca­lyp­tus! Must have maple seed pods! Love them! Luuuuurve the wreath design! So beautiful and simple! the wreath is definitely my favorite! I like the wreaths and eucalyptus! The wreath is definitely my favorite – very simple, classic! Maple Seed Pods – how unique & whimsical! I love the wreath, it’s so delicate and simple! I love the eucalyptus! Would love love love to win, they are so pretty! Love, love, love the wreath! It is perfection. The feather is divine but they’re all quite lovely. the maple seed pods are delicate, special. amongst the other beautiful motifs. I absolutely love the wreath! I love the wreath. It is such a simple and classy holiday motif. I love the wreath! After getting married this spring, this will be the first year my husband and I send cards as a couple and I have been trying to find the best cards to send to our family and friends. These would be perfect and I would love to win! I really like the eucalyptus! It is so unique. i can’t believe how cute/gorgeous these are! i’m really digging a lot of them, but mostly the wreath. I adore the feather design! love the foilage – simple. beautiful. love it. Love the wreath … so classic. The wreath is a perfect symbol for this season – I am hoping to keep this year’s advent time as simple and peaceful as that image. I absolutely love the Eucalyptus design! Anything to remind me of spring plants during dreary winter. These are stunning! I like the Wreath! I love the feather – so simple and beautiful. Sooo hard to choose! They’re all so lovely. If I must: the pods. My favorite is the elegant wreath. But I also love the eucalyptus. And the feather. And the foliage. Okay, who am I kidding? I am a sucker for anything letterpressed! The wreath is divine. It sums up the joy of the season with amazing simplicity. They are all beautiful! The wreath is definitely the way I’d go! I really like the wreath! I love the wreath in green! Love the wreath in the crimson red! Gorgeous…. Thank you so much for this chance. I love the wreath the most, but the other ones are pretty great to! I’m in love with the eucalyptus. It reminds me of chirstmas in so. cal! Absolutely adore the wreath. These are perfectly my style. Thanks for the chance to win! I really like the wreath. Reminds me of the Christmas I always aim for…Simple. Thanks for the chance to win! I love the wreath. Reminds me of a simple Christmas, which is my fav. I can’t pick between eucalyptus and foliage. Thank you so much! i love the wreath and the feather. so cute! I love the feather.It is so beautiful…. I love the wreath. I would love any part of this and feel honored to win.Thanks for giving me the chance. I have a little bird who lives with me so the feather is always my favorite! I love the wreath design… it’s so festive! the maple seed pods remind me of when I was younger but I would have to go with the eucalyptus if I won. They are just so pretty and elegant! I love the sprouts…so cute! I love the eucalyptus. Wonderful cards! So hard to pick! They’re all gorgeous. I think I would pick the maple seed pods though. Ooh! Pick me! Pick me! I like the feather. How fun it would be to send these out this year? I love the wreath! I am in LOVE with the sprout motif! They’re all beautiful….especially love the seedpods! I simply adore the wreath cards! Every year, I always spend hours searching for the perfect holiday card and I think I have found them! Lynn is so, so talented! All of them are so beautiful, but I love the eucalyptus. they are all so very beautiful! i think the wreath is my favorite. i couldn’t imagine opening a card this beautiful for the holidays. I forgot to add that I love the wreath! I absolutely love the eucalyptus cards. So simple and elegant. The wreath is perfect — simple and clean, yet cute and fun! I vote for the wreath–a classic! i love it. especially because i’d probably give it with fruitcake. or cookies. I love the wreath and the maple pods! They are gorgeous! The designs are fantabulous! Hard to pick just one… then i’d have to pick the maple seed pods. the feather…so sweet! love the calendar too! Like Rachel from Heart of Lights…I’m not much of a card person (these days)… but I will definitely use these cards…It’s so simple and elegant. I love the wreath!! It’s just perfect!.. Love the wreath! When I look at it, it reminds me of the holiday season. Ohhh what a wonderful giveaway.. I love the feather!!! Love love love the feather! I love the wreath! But they are all so cute. Thanks for sharing. they are all gorgeous, but I have to say the wreath is my favorite. It is blissfully simple, and full of joy….just what the holidays should be. my favorite motif is FEATHERS! I really love the wreath motif. So beautiful! the feather motif is gorgeous. just gorgeous. Love the feather! So pretty! What beautiful work Lynn does. The print “For Glen” is just touching. As for a motif, well there are so many choices – i love the feathers, the geometric triangles, the simplicity of the wave, and all of the delicate drawings of the flowers are beautiful. Thanks for sharing – i’m off to place an order! I LOVE the wreath in silver sage!! Beautiful cards! I love the eucalyptus and the wreath but I think I’d go with the eucalyptus – so beautiful! Lovely designs, but the eucalyptus motif is my favorite! Thanks for the chance to win~!! The maple seed pod is fantastic, I just love it. The wreath is definitely my favourite! The eucalyptus is my favorite. Very beautiful! Oh I love the feather so much!! Fabulous! So inspiring & beautiful – I do love the Birds of a Feather! Oh, I adore the wreath! They are all lovely though. I really like the wreath — the circle somehow seems to mean many things, all inclusive. Beautiful cards! They are all simplistic & pretty. My fav for the holidays is the wreath! I love the feather…they are all gorgeous though. Oh my goodness this would be such a treat to welcome the holidays with Satsuma! These are absolutely lovely. Jut put your site under my “favorites tab”. Heres to winning! I love those maple seed pods!! (I also love the 2011 letterpess calendar! I love the wreath. It’s so classic.